USDJPY broke below the bullish trend line on the 4-hour chart, suggesting that consolidation for the uptrend from 109.70 is underway. Range trading between 111.20 and 111.82 would likely be seen in a couple of days. 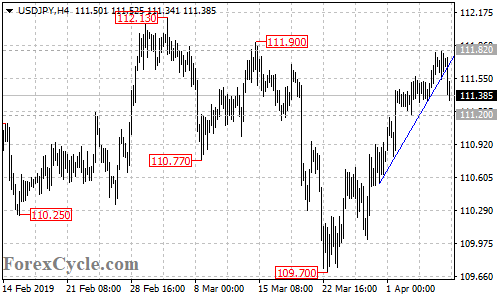 As long as 111.20 support holds, the upside movement could be expected to resume, further rise towards 112.50 area is still possible after the consolidation. On the downside, a breakdown below 111.20 support would indicate that the upside movement had completed at 111.82 already, then deeper decline to 110.00 area could be seen.